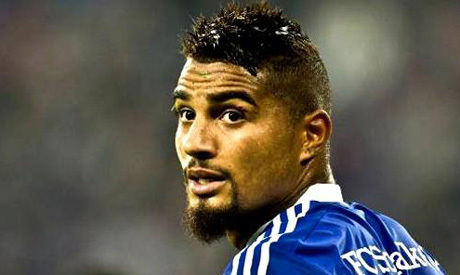 Kevin-Prince Boateng has returned to AC Milan on a six-month deal following an unhappy spell at Schalke 04 and an aborted move to Sporting Lisbon, the Serie A club announced Tuesday. German-born Ghanaian international Boateng played his last match for Milan in August 2013 but has been training with the club for several months after failing to secure a deal at Sporting, having quit Schalke under a cloud last May. A statement by the seven-times European champions said: "AC Milan announce that Kevin Prince Boateng has signed a contract with Milan until 30 June, 2016." Milan coach Sinisa Mihajlovic, meanwhile, said: "Boateng came here to train and has done really well. He has character and can be useful because he's a versatile player. "It's only right he was given a contract until June." Milan did not say whether Boateng's contract would be extended after the summer, but the short-term deal has only added to the intrigue surrounding Boateng's return to the club for whom he has played a total of 100 matches across all competitions. After the midfielder quit Schalke at the end of last season, the 28-year-old was set for a move to Sporting Lisbon only to be rejected by the Portuguese giants. Officially, Boateng failed to secure a deal because of a disagreement over the players' image rights. However a spokesman for Sporting later claimed Boateng had "failed the club's medical tests because of a problem with his knee". AC Milan, who host Bologna at the San Siro on Wednesday, sit in sixth place in Serie A, eight points behind leaders Inter Milan.